Clackamas County "continues to grow and prosper, and that is not to say that we have solved all of our problems," said County Board Chairman Jim Bernard in introducing the State of the County event this week. 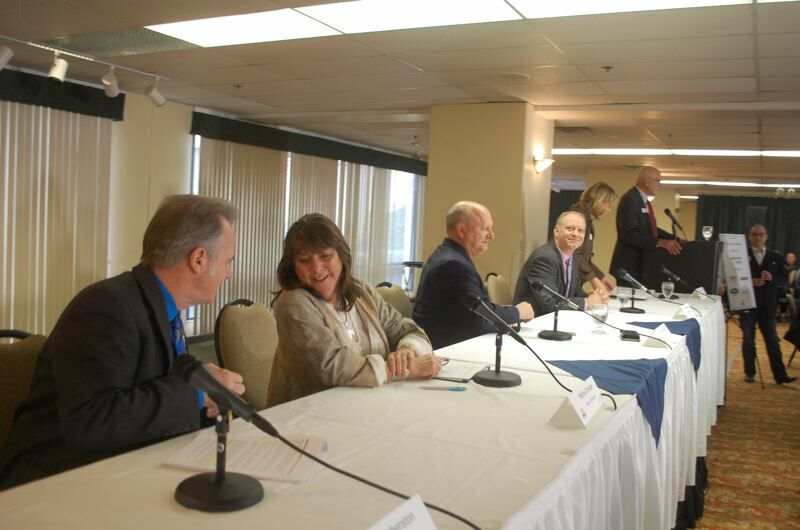 All five county commissioners spoke at the Jan. 31 event hosted by the North Clackamas Chamber at the Monarch Hotel. Transportation issues came up again and again at the event. Sunrise Corridor remains the most important priority for Clackamas County itself, while the county is supporting a widening of Interstate 205 between Oregon City and Lake Oswego's Stafford Road as the No. 1 regional priority. A $1.5 trillion federal infrastructure investment proposed by the White House, along with potential future investments by the Oregon Legislature, could provide funding for these projects. Last year state legislators passed House Bill 2017 to study congestion pricing and provide funding to plan, but not construct the widening of I-205. Commissioner Paul Savas said that he'd like to see the tolling plans for I-205 go into funding transportation projects, not just discourage people to use freeways during peak periods. "People want to see those [tolling] dollars invested into the system itself," Savas said. Bernard pointed out that anyone who looks at a TriMet map will see how there are many more bus lines in Portland than in other parts of the service district. "We're trying to advocate for more of those dollars our way," Bernard said. "We need more jobs," Savas said. "It's highly critical; it's important that we get our fair share." County officials have hired a consultant to poll the community to see whether local communities would support a vehicle-registration fee, with or without a public vote. Increasing gas taxes have helped shore up a funding stream for the county's road-maintenance priorities, but the county remains several million dollars short. "We generally don't do well when we put things out to a vote," Bernard said. "We have a list of projects that we need to do." In 2017, the county made "a painful but necessary decision" to sell Oregon City View Manor, the oldest low-income housing complex in the state, a decision that Bernard said was made necessary by fewer federal dollars for subsidized housing projects. Bernard said the sale will create a long-term solution for the county's low-income families by using the proceeds to create smaller pockets of subsidized housing throughout the county. Groundbreaking is tentatively set for March on the county's village of up to 30 sleeping pods for vets. The pods are being made in Oregon City reusing pieces of a Pickathon music-festival stage in Happy Valley and eventually will end up in the Clackamas Industrial Area. "We could do better, but we've got to start somewhere," Bernard said. "The homelessness rate in all of our [school] districts is particularly high." Commissioner Martha Schrader praised Oregon City Commissioner Nancy Ide for helping develop a framework for addressing OC homelessness through a local coalition of homeless advocates and city officials. "Thank you for that work, because it was probably one of the most exciting meetings we've seen in a long time dealing with that issue," Schrader said. County Commissioner Ken Humberston was credited with two areas of focus, helping resolve the dispute over local urban-reserve areas and advocating for the use of cross-laminated timber. He said that the county will be using cross-laminated timber to harvest local non-old-growth forest lands in a way that will be supported by local environmental and business groups. "Think of plywood on steroids," Humberston said. "It has gigantic advantages." Commissioner Sonya Fischer called on all of the people in the county to step up and help in finding creative solutions for preventing carbon output that has been shown to cause more and more natural disasters lately such as hurricanes, fires and floods. "We're seeing climate disruption right now," Fischer said. Fischer said she helped the Multnomah Bar Association get a courthouse in Multnomah County, and from that experience she knows that "it's not a done deal" for the county and the state to each contribute $78 million toward a new Clackamas County Courthouse proposed to move from downtown Oregon City to OC's Hilltop area. A question from the audience asked why the county is not planning to reinvest the proceeds of the sale of Hood View Park back into Happy Valley. Commissioners explained that the majority of the park construction was not paid for by Happy Valley, which is now suing the district. "We would invest in Happy Valley, but they've requested to withdraw from the district," Bernard said. "Why would we invest parks-district funding into something that's withdrawing?" Happy Valley and county officials have another meeting to negotiate a potential resolution of the lawsuit this month before the case goes to court. "From the early days, we really did a lot of investment in that area," Schrader said. "A high growth area gave them a lot of opportunities." As previously reported, county and Gladstone officials recently found a way around a separate lawsuit by proposing to build two libraries for the city and Oak Lodge, both managed by the county. The "best part" about the plans for the two libraries, Bernard said, is that the people will determine — through a robust public outreach process — the size and scope of the libraries.